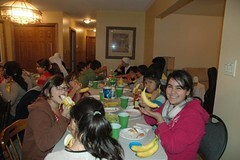 On the last weekend of October, an encounter of the Home took place in London, Canada. The sisters currently in the community of Ave Maria, Florida, flew to Detroit, Michigan, where they were picked up by Jaime Arturo, member of the HM Community of Adults, who took them to London. During the visit of Father Rafael, Mother Ana and Sister Montse to our communities in Ecuador, around 160 people got together for an encounter in Playa Prieta. 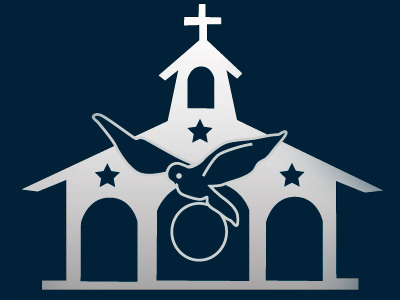 Most were members of the Home of the Mother and the encounter took place from November 21st to 22nd. Quino and Monica, members of the Home of the Mother, have had their first child. Her name is Almudena and she will be baptized on December 12, feast of Our Lady of Guadalupe. She was born on October 9th, and the whole family is very happy. Monica has been a member of the Home of the Mother since 1997. She lived in the Home's residency for college students for several years and also spent some time in our house in Zurita, Cantabria, working for HM Television. 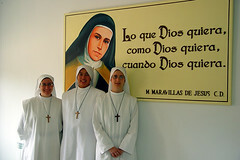 Two weeks after the foundation of Lumezzane, three Servant Sisters, Sister Beatriz Liaño, Sister Sonia Moset and Sister Grace Silao arrived at Getafe, Spain, to found another community. A U.S. Pro-Life initiative called "40 days for Life" took place from September 23rd to November 1st. During this time prayer vigils were held in front of various abortion clinics, praying and fasting for an end to abortion. On the 26th of September, "40 Days for Life" was opened in Jacksonville, Florida, with a Eucharistic celebration presided by Bishop Victor Galeone. After the Holy Mass offered for the unborn, there was a procession with the Blessed Sacrament from Assumption parish, where the Servants Sisters are currently working, towards a pro-life center to help women, which is providentially located next to an abortion clinic. 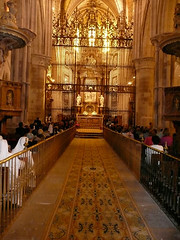 On September 26, 2009 in the Cathedral of Cuenca, Spain, Brother José Javier Martíns de Passos and Brother Reinhard Fuchsluger, Servant Brothers of the Home of the Mother, were ordained priests by Bishop José María Yanguas. The first of the two is Spanish and the second Austrian. Both of them entered the Servant Brothers in 2001. On September 13, 2009, a new community of Servant Sisters was founded in Lumezzane, a village in the province of Brescia, northern Italy. The World Youth Day Cross, an initiative of Pope John Paul II, which is now on tour in Ecuador, was recently in our Province of Manabi. On December 18th, we received it in Chone. We had our first encounter with it at the local University “Eloy Alfaro.” We were allowed to use the university auditorium and there, we hoisted the Cross which would preside the event held with students from the university and from “Santa Mariana de Jesus” School, who had the cross at their school in the morning hours, prior to its arrival at the university, at 4pm.